Medical malpractice occurs when a healthcare practitioner fails to exercise the proper degree of skill and care required by the profession. An article published in the Journal of the American Medical Association (JAMA) estimates that 250,000 deaths per year are caused by medical errors. This makes medical errors the third most frequent cause of fatalities in the US, after heart disease and cancer–and medical malpractice cases often go unreported, so they could be even deadlier. At McWhirter, Bellinger & Associates, we have the experience and resources necessary to bring your medical malpractice lawsuit to court. You have a limited amount of time in which to file a lawsuit, so contact our medical malpractice attorneys at (888) 353-5513 as soon as possible. By its nature, medicine is incredibly complex. Even the smallest error committed by a doctor can have life-altering consequences. Physicians study and train for years to equip themselves with the knowledge and skills they need to meet their profession’s accepted standard of care. Unfortunately, medical malpractice still occurs, leaving patients worse off than they were before they sought help from their doctor. Medical malpractice law helps keep doctors and hospitals accountable for their actions (or inaction). Misdiagnosis and delayed diagnosis happen when your doctor fails to correctly diagnose your condition. The doctor may conclude there is nothing wrong with you, may treat you for a condition you do not have, or letting the real source of your illness go untreated. You could end up being harmed by your existing medical condition and the inappropriate treatment. Misdiagnosis and delayed diagnosis cause around 40,000 deaths every year combined. Failure to diagnose cancer and other life-threatening diseases like meningitis can be particularly harmful to your health. When these are diagnosed too late, patients may miss their chance they needed to fight the disease in its early stages. Advanced-stage diseases often involve difficult, painful treatments that do not guarantee a successful outcome. Surgical errors can occur when a doctor performs surgery on the wrong site, unintentionally pierces a vital organ or leaves a foreign object inside of the patient’s body. Such errors are often caused by miscommunication between different branches at a large hospital or surgical practice. Anesthesia errors pose an inherent risk in any major medical procedure. Your medical history, allergies, current medications, and other factors should all be thoroughly examined by an anesthesiologist prior to your surgery. Anesthesia malpractice can occur by failing to examine you sufficiently in the medical review, or by applying anesthesia incorrectly during the procedure itself. Prescription errors can happen when a doctor misdiagnoses your condition, or simply prescribes you the wrong medication. You can experience serious side effects from unnecessary drugs, and these can have a damaging impact on your long-term health. Failure to warn a patient about risks associated with a procedure may cause the patient to take a risk that they wouldn’t be comfortable with taking if they understood it. Lawyers call this informed consent, and it applies to non-emergency cases in which informing the patient will not cause their condition to worsen. Veterans Administration medical malpractice lawsuits have been filed against VA hospitals who have delayed the care and treatment of patients who come to them for help, going so far as to hide these long wait times to the government. Over 26 facilities have undergone investigation in recent years. 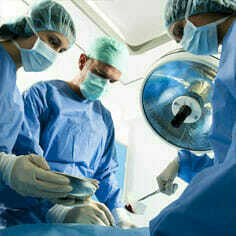 Medical malpractice lawsuits are not always brought against doctors. Occasionally, the hospital in which you stayed, the manufacturer of medical equipment used on you, or another medical professional may be responsible for your injury instead. If you have suffered as a result of some medical negligence not covered above, you may still have grounds for a lawsuit. Bring your case to the Lexington attorneys at McWhirter, Bellinger & Associates, and we’ll help you figure out whether you have a case. Approximately 40,000 people die every year because of misdiagnosis or delayed diagnosis, and countless other patients are left with new injuries or illnesses on top of what they already had. Doctors, nurses, and other hospital staff members who fail to pay attention to your symptoms—or rush to diagnose a complicated condition—often end up leaving you vulnerable to unnecessary consequences. This type of medical malpractice should not be accepted in our modern healthcare system. We should be able to trust our doctors to give our medical problems their full attention until the right solution is found. If medical negligence caused injury to you or one of your loved ones, you have a right to seek justice. Doctors should be meticulous when examining your symptoms and following up on tests. Otherwise, a serious or life-threatening illness—such as cancer or meningitis—can develop beyond its early, more treatable stages, advancing to the point where it is difficult or extremely painful to treat. Early detection of cancer prevents death and the need for painful and expensive treatment such as disfiguring surgery, radiotherapy, or chemotherapy. Some studies suggest, however, that approximately 128,000 American cancer patients suffer some degree of damage as the result of having been initially misdiagnosed. Such misdiagnoses primarily occur from improperly conducted blood or tissue sampling, or to a misreading of laboratory results. Among the most commonly misdiagnosed are breast, colon, cervical, prostate, and esophageal cancers. Cancer is progressive and is viewed in certain stages by medical professionals. Staging is the process by which physicians assess the size and location of a tumor. Early diagnosis of cancer is critical because a cancer patient’s survivability rate is directly related to the stage the cancer was in when it was detected. There is a multitude of tests and imaging processes in addition to those already mentioned by which physicians can not only diagnose cancer but also determine the stage it is in. Failure to diagnose cancer cases are often complex. In addition to requiring knowledge of the applicable laws, they require knowledge of the current medical practices involved. A medical malpractice attorney in South Carolina must have the relevant experience and resources necessary to determine if cancer should have been diagnosed earlier. And because of the statute of limitations, (time limits by which you must file a claim in your state), you should have your potential claim reviewed as soon as possible to ensure that your rights are protected. For decades now, allegations have circulated in the press that veterans are dying while waiting to receive medical care in VA hospitals across the country. Now, new accusations say a Phoenix VA hospital is intentionally hiding just how long it takes for our veterans to receive the urgent medical care they need. CNN has reported that a Phoenix VA hospital had two lists. One list was kept only in hard copy, and it contained the names of veterans waiting for medical care. The other list was the one the hospital used to report wait times to the government. According to CNN, at least 40 veterans died waiting for medical appointments on this secret list. The VA has admitted to only 23 deaths caused by delayed care. As of May 23, there are 26 VA facilities under investigation. The various types of malpractice listed above make it seem like doctors can be sued for any little mistake they make. Medical procedures always come with inherent risks, and a poor medical outcome does not always mean that negligence has been committed. Because of this, deciding whether or not you have a valid case that is worth pursuing can be a nuanced process. To make matters more complex, doctors are usually hesitant to admit when an error occurred during treatment, which often leaves patients with more questions than answers. While doctors are not expected to be perfect, they are expected to at least be competent. They are only guilty of medical malpractice if the mistakes they make are so egregious that they fall short of the acceptable standard of care. Did the doctor/patient relationship exist between you and the doctor? Did the doctor’s negligence cause your injury? Did the injury lead to specific damages (medical bills, lost income, physical and mental anguish)? Would a competent medical professional have avoided injuring you under the same circumstances? If you can definitively show that the answer to all of these questions is “yes,” then you are likely to win your medical malpractice lawsuit. The last question, however, is difficult to prove, because there’s no strict definition of what a “competent medical professional” is, and circumstances in medical cases can vary wildly. Our experienced Columbia medical malpractice lawyers work with a team of medical experts to establish and prove all of the essential elements of your claim. We have the resources and skills you need to pursue a successful case. Proving what the standard of care should have been and that the medical professional in question failed to meet it, requires the help of expert witnesses in any type of medical malpractice lawsuit. In South Carolina, an expert must sign an affidavit before you even file your case. The law requires you to file a Notice of Intent to File Suit, which must include the facts of your case, a list of all parties you intend to file against, and an expert’s affidavit that affirms their belief that you are entitled to damages. Even after proving that the medical professional owed you a standard of care and breached that standard of care, you still have to prove that their failure to comply with the accepted standard of care resulted in whatever damages you are suing for. This is where the legal help of McWhirter, Bellinger & Associates will come in handy. Our medical malpractice lawyers have many contacts with expert witnesses who can examine your injuries and report on the extent that your condition worsened from the medical malpractice. Because of the complexity of the medical malpractice laws and need for expert witnesses, it is always advisable to contact one of our medical malpractice lawyers as soon after injury as you are able. The sooner we can evaluate your case and begin gathering evidence, the stronger our medical malpractice lawyers can build your case. Requirements for filing a medical malpractice suit vary from state to state. Each state has its own time limits on when paperwork needs to be filed and how much you can receive in damages. This is another reason to hire an attorney: If you have been injured because your healthcare provider did not follow medical standards of care, you will want an experienced medical malpractice lawyer to handle your case. Before filing a medical malpractice claim in South Carolina, you must file a Notice of Intent to File Suit. This is a statement of facts that shows you are entitled to relief, and which parties you intend to file suit against. In addition to writing and filing your Notice of Intent, our Sumter medical malpractice attorneys will hire an expert witness to examine you and provide a signed affidavit attesting to your entitlement to relief. South Carolina law also requires you to participate in mandatory pre-litigation mediation. Within 90 to 120 days of filing the Notice of Intent to File Suit, all parties must meet and attempt to settle the dispute without going to the courts. Our medical malpractice lawyers will coordinate this mandatory mediation, and we may even come away with a settlement that prevents you from having to go to court at all. While the medical profession is and should be, admired, we should be able to trust that our illnesses and injuries will not be aggravated by the negligence of a healthcare professional. Dealing with the consequences of a medical error can be both emotionally and financially devastating to the victim as well as to his or her family. If you or a loved one has been injured as the result of a medical error, you may be entitled to compensation that can at least mitigate some of the financial burdens that inevitably emerge. 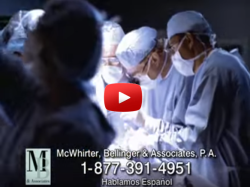 At McWhirter, Bellinger & Associates, our medical malpractice lawyers have seen a great variety of medical malpractice situations and have built up the contacts and experience to be able to build a strong case for you. With offices in Aiken, Camden, Columbia, Lexington, Newberry, Orangeburg, and Sumter, South Carolina, we can arrange for you to have a free legal consultation. For immediate help, call today at 888-353-5513 or fill out a form at the top of this page.